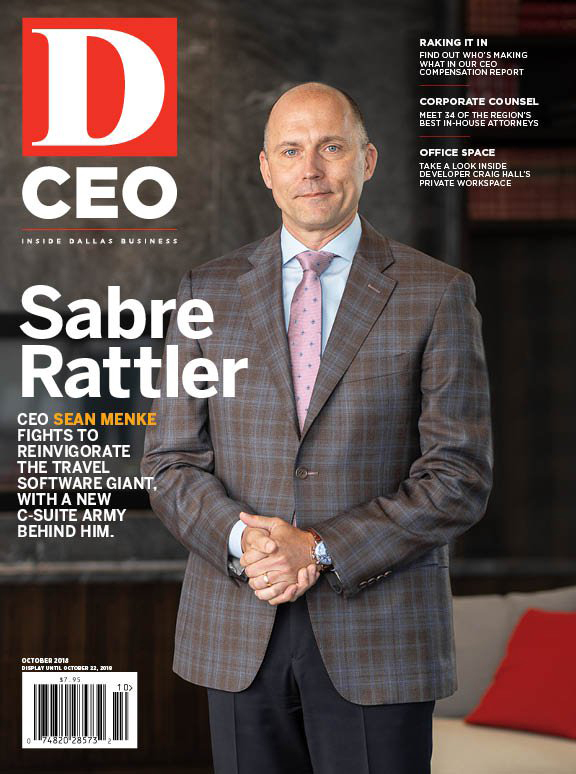 By D CEO | 6 months ago CEOs of Six Flags, Basic Energy, and Spirit Realty top the list. Plus, breakdowns by industry and mix of pay in this year's study of middle-market CEO compensation. By D CEO | 6 months ago The lessons learned, inspirations, and funniest experience of the Dean of SMU's Cox School of Business. By Sherrie Clark as told to Alex Edwards | 6 months ago The chief technology officer at ABB Integrated DC Power on the lessons she took from her newborn's stint in the NICU. By Julia Bunch | 6 months ago The HALL Group founder tells us about the tie Herb Kelleher sent him and other things around his Dallas Arts District office. By D CEO | 6 months ago The Plano mayor and Harlem native on keeping a professional look with an urban flare. By Amrit Kirpalani as told to Amy Roh | 6 months ago The NectarOM co-founder and CEO discusses his upbringing and the way his parents stood up to adversity. By Madeline Fry | 6 months ago And he has some thoughts about how easily we seem to separate the number crunchers and creatives of the world. By Julia Bunch | 6 months ago Philip Wise and Barry Hancock have been involved in dozens of projects in Southern Dallas over the years. They've all been leading to this. By Thomas Korosec | 6 months ago Harvey helped the Irving company navigate the legal fallout that occurred after former executives started up a competitor. By Jeff Bounds | 6 months ago As local banks decide how blockchain will factor into their businesses, they must determine how to maintain their role as trusted intermediates. By Amy Roh | 6 months ago There's yoga, shepherding her 6-year-old twins to school, and plenty of meetings for the nonprofit's leader. By Julia Bunch | 6 months ago As more evidence surfaces that we're building too many parking spots in North Texas, developers are asking how they can discourage costly and under-utilized garages. By Thomas Korosec | 6 months ago The general counsel at Electronic Transaction Consultants entered the fray after a legal blow to the company. By Caitlin Clark | 6 months ago The 42-year-old company, led by reality show regular Travis Hollman, has become an unlikely backdrop for the post-workout flex. By Thomas Korosec | 6 months ago The company's SVP and assistant general counsel took on a case that put its reputation on the line. By Kerry Curry | 7 months ago Two and a half decades later, it's one of the most active in the U.S.
By Julia Bunch | 7 months ago Stephanie Keller Hudiburg heads the Deep Ellum Foundation at a pivotal time for the neighborhood. By Thomas Korosec | 7 months ago C-suiters are selling heavily at the same time they’re buying back stock with company cash. What gives?